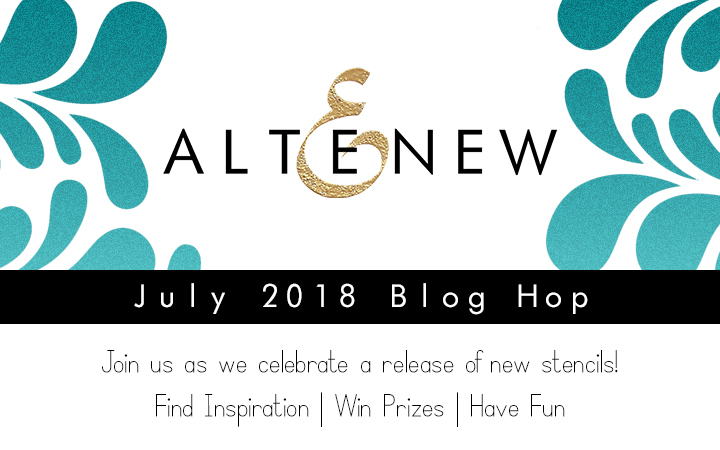 And welcome to my stop in the Altenew July 2018 Stencil Release Blog Hop! You should have arrived here from Rubeena Ianigro's blog, however if you need a map, a full list of the blog hop is listed below. I can’t even tell you which one is my favorite, because I love them both! I hope to inspire and help with some of your wish list decision in my projects today. Let’s start with the new Elegant Swirls Stencil! I love the focus on the swirls that I have highlighted with orange color. At first I masked the backgriund and ink blended Altenew inks to create a pop of color. I then applied Nuvo glimmer paste over it and removed the mask. I then die cut the word "hugs" from the Script Words Die Set and heat embossed the remainder of the sentiment "Your Day is Amazing" in white embossing powder. And of course some white accents to complete this card. Next up, is the absolutely stunning Mega Hydrangea Stencil. The detail of these flowers are just gorgeous. And one more my love is a round form of the card! I decided to make this form with a beautiful background, so I made the background using Nuvo Embellishment Mousse. This card came out so romantic, tremulous and gentle. Therefore, the sentiment here is so sincere "Because you are extra special". Last up are two cards featuring the new City Scene Stencil. The design of these cards is quite simple and fast, but they turned out very charming! So to create a background for my card I used City Scene Stencil – I love how easy it is to create a backgrounds with its help. However, I wanted to make a landscape, so I combined it with Elegant Swirls Stencil and applied swirls at the top of the card - it turned out a great summer sky! To create a sentiment I die-cut a circle out of grey cardstock, die cut Hope word in the centre and replaced it with a word cut out of white glitter cardstock and also heat embossed "never lose" and "tomorrow is better" in white embossing powder onto brown cardstock. In the life card looks elegant and charming! For this card I combined the City Scene Stencil with Birds of a Feather Stamp Set. A bird, sitting in the background of a big city looks very epic, is not it? For the silhouette of the branches I used a coordinating die from the Forever and a Day Stamp Set . I will be giving away $30 gift certificate to ONE lucky winner from the comments left here. I will announce the winner on 7/11/2018 here. YOur projects are so beautiful! love the city skyline with the bird! Love these projects, great designs! Really love the way you have your diecut on the hugs and hope cards! What great use of the new stencil release for your backgrounds. These are all so pretty! I LOVE the way you have introduced these pretty shapes! The circles give them a beautiful, unique look that I'd love to try myself! Thanks for the great inspiration today! Amazing cards! So very pretty!! Very nicely done. I love the round card with the city behind the bird. What a cool idea. Wow. I love all of these projects. I would love to learn to do the multicolor stenciling with the nuvo glitter paste on top... so pretty! Yes the bird does wonders for the city you made. Love it! Love the way you used these stencils. The glitter paste is so pretty and the cityscape is great with the little bird! So pretty! I thank you for providing such great cards .....so many new ideas.....awesome!!! Super pretty projects, especially love the unique design combining the City Scene and Elegant Swirls stencils. I am in love with the “I’m here for you” card. It’s such a beautiful design. Wow! Amazing cards. I love your unique design. Wow, who knew you could do so many things with the stencils!! Love that elegant round card!! Gorgeous!! lovely cards - great designs - thanks for the inspiration! The first card is gorgeous it one of my favs I have seen on this blog hop so far! Great cards! Especially love your first!! Love how you created the city scene behind the bird on the twigs. So creative! Loving these stencils even more with your inspiration. Thank you! Love these new stencils and your cards are just so gorgeous! Beautiful cards and I love your backgrounds you used with the beautiful colors! Very pretty cards! The Cityscape has become one of my favorites on this hop because I love how most of your are layering to add depth and dimension. The circle with the bird looks great! Very pretty cards. Love the city scape with the birdie! I love your elegant swirls card! I would have never thought of ink blending and then covering with glimmer paste. You have such imagination! I really like how you used the embellishment mousse with the hydrangea stencil.... that project is so beautiful! Great cards I love the City scape. TFS. Love the city card with the flourish. Great idea. Huge fan of the Hydrangea Stencil! I love how you used it in circular form, so different! So pretty and unique cards! Such creative and beautiful designs! Love them all! These are so delicate & pretty. Love how you combined stencils to create scenes. I didn’t realize you could put color underneath glitter paste. Thanks for sharing! Thanks for sharing your beautiful cards with us. I love the glittered embossing powder you used. Thanks for the inspiration. The bird on the cityscape made me smile, how original! These are all fabulous. My favorite is the one with the bird. So beautiful! I adore your colorful glimmer pasted stencil, it POPS! Love your cards. So creative!! Fantastic designs! Love all the texture you created for the backgrounds, thanks for sharing! So many unique designs on your cards. Wonderful! I love the round card! Great cards - love the stencils and the glimmer paste. Each one more amazing than the one before! I didn't see the hydrangeas in the stencil until your card. I love the colors in these cards - great way to add texture too! Very nice cards! Great job! Sweet and wonderful cards using the new stencils! I like your cards. They are all so interesting and unique. Absolutely fabulous! I love the idea of round cards! So creative! The ink blending on the Elegant Swirls card looks gorgeous with the glimmer paste on it. I also love the circle cards, especially the hydrangea one with the Nuvo mousse. It's so unique! PRETTY CARDS! I especially like the one that is in the shape of a circle with the bird on it! Very sweet!! Gorgeous designs! The Nuvo glimmer paste really adds so much texture and bling. Love it!! Your circle cards are great! Love the sentiment with the city scene stencil is perfect! Gorgeous pieces - I adore the glimmery rainbow flourish background! your cards are fabulous! I really love the round one with the Hydrangea stencil, so soft and elegant. Оля, очень красивые! Все! Какая ты умничка талантливая! Super beautiful set of inspirations! Love your work! Beautiful cards! :) Love seeing all of this great talent on this blog hop! Great cards. I love the one with glimmer paste. Can't wait to try your first technique. Your cards are awesome, perfect showcase of the new stencils! Wow!! !Such gorgeous cards! They are so very special with so many different ideas! Thanks so much for sharing! Beautiful,elegant and fun cards! Fantastic use of the new stencils. luv the effect of the glimmer paste! These are so pretty! Love your card with the Elegant Swirls stencil... fabulous colors! Your cards are so gorgeous! Love the round one with the bird. Beautiful cards, Olga! I love your unique design with the City Scene & that awesome bird! Olga, your cards are so creative! !Really love your choices in colors and glitz! All are so beautiful!! Love the new release. And the inspiration cards are gorgeous! I especially love the first and second cards.They are really beautiful and unique.